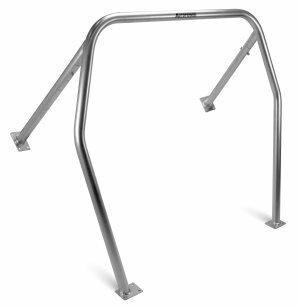 Our roll bars and cages meet or exceed the safety requirements for most competition sanctioning organizations. Our bars and cages have been designed to easily install and provide maximum protection. The fit in your vehicle allows quick and easy entry and most importantly, quick exiting, while conforming closely to your interior for a clean, unobtrusive look and feel. All of our bars and cages are certified MIG welded and precision jig notched, providing you with the maximum strength and best fit available. Every roll bar or cage has been designed to fit specific car models so only minor modifications are necessary for the installation. Most applications are a true bolt-in and require NO WELDING. Please refer to the application guide to see if a model is available for your vehicle. In most cars rear seats and/or convertible top remain in place and useable. All necessary installation and mounting hardware with back-up plates are included. Black enamel is applied to all roll bars and roll cages. This is a cover coat only to deter corrosion during transport. Minor paint damage to this finish during shipping should be expected as these items cannot be boxed for transport. You may want to refinish products before final installation. It is best to check fit and drill all holes before you repaint. There is NO paint finish guarantee. Please read the 'Truck Freight' shipping policy in the 'Policies' section before ordering. Contact us with questions.